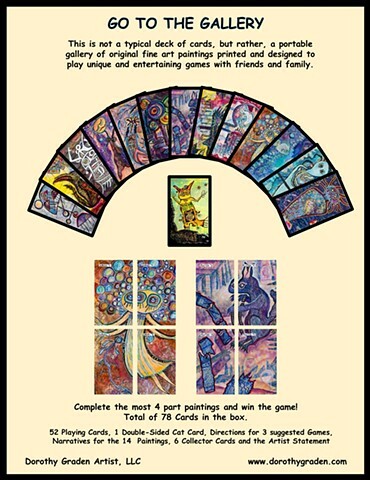 This is not a typical deck of cards, but rather, a portable gallery of original fine art paintings printed and designed to play unique and entertaining games with friends and family. GO TO THE GALLERY is one of the games you can play. If you collect the most paintings you win the game. All the paintings are divided into fourths. There are also 14 cards with entire images on them with narratives on the back. I've also included 6 Collector Cards. Artist statement and instructions for games are also included. Packaged in a beautifully printed black glossy box.